I'm chilling out in New Jersey, spending time with my daughter and generally being lazy after a hectic RTC schedule in Washington. I made a really good decision by deciding to attend the Building Content Summit which preceded the main event. 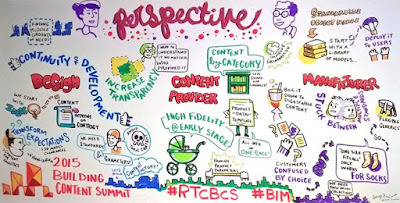 I've posted about the content issue many times on this blog and in the process my own views have evolved considerably ... to the point where I think "content" may be the wrong heading for a discussion of supply chain BIM. 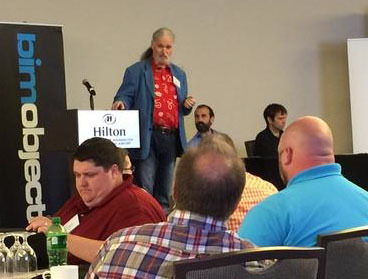 The mix of attendees was really good and even though it came under the auspices of the Revit Technology Conference, Bentley and Graphisoft were given equal billing and made excellent contributions. Hats off to the organisers for facilitating this and coming up with a great format for the day's proceedings. Manufacturers, content providers and designers were all well represented, but perhaps we were a little light on contractors and owners/facilities managers. I think this was probably good though. Better to keep things relatively simple for the first version of this event than to attempt to be all embracing and end up lacking focus. 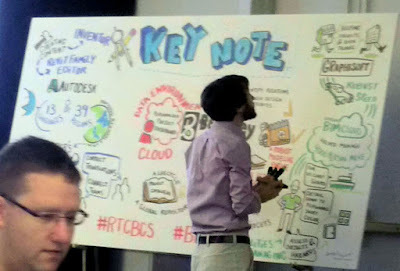 One neat feature was the live "recorder" who sketched out a visual record of the discussions blow-by-blow on a large white board. My contribution was a short "rebuttal" on behalf of designers which was great. I'm likely to present a somewhat contrary viewpoint in any case so I enjoyed being asked to do just that. I think we have the horse befor the cart. 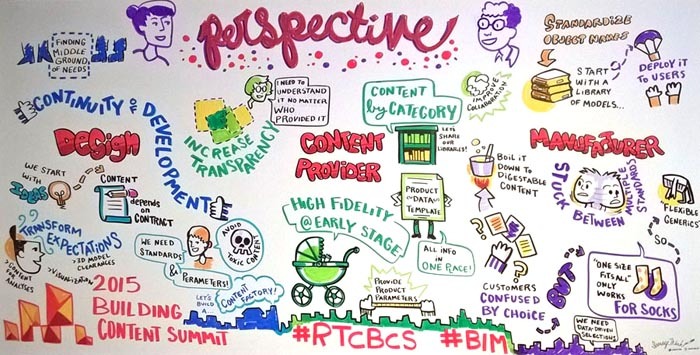 It's not about getting the manufacturers to supply better BIM content. 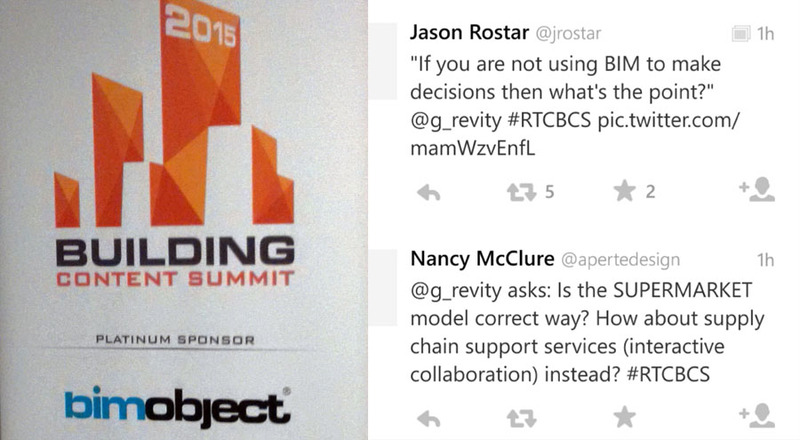 It's about using BIM processes to extend collaboration beyond the design team. 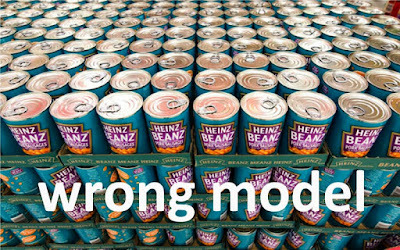 We all know that BIM is about collaboration, so why to we insist on using the metaphor of a "Content Supermarket" Why have we decided to line canned "BIM objects" up in rows on virtual shelves up in the cloud ? We already have well-established collaboration procedures. Many manufacturers employ full-time support staff around the world to help the design team with product selection and to provide in-depth knowledge and experience in specialist areas. In reality, manufacturers, suppliers and specialist installers were part of the design team long before we started using computers. We already exchange drawings and schedules, hold brainstorming sessions, engage in collective decision making. But sadly it tends to be a different "we". While project architects and specifications advisors are collaborating the "old-fashioned" way, BIM managers and head-office technicians are focused on the supermarket metaphor. In other words we are engaging the wrong people using the wrong model. The split between design and documentation pre-dates BIM. It's been around for generations, centuries perhaps. But as the technology becomes ever more complex, the rift deepens. I think it's very dangerous and have tried to remain in the middle ground, somewhere between a designer and a BIM manager. Sometimes it feels like there is no ground, out there in the middle: that I'm suspended above the grand canyon. We need to build bridges, which is why I like to talk about this stuff. Previously I've called them Cloco Zones: user-friendly spaces where designers and manufacturers can collaborate using intelligent 3d models. There was a sharp intake of breath when I suggested this at the summit. No way am I letting a manufacturer into my model. But that's not what I'm proposing. Middle ground is what we need, somewhere that's connected to the digital worlds on both sides, but with the control to push and pull only what you choose to exchange. All along I've been using door hardware as an example of how this could work, and it turns out that Assa Abloy have already developed something along these lines. I'd heard of this before, but not seen it in action. They had a booth at the main RTC event (I'm pretty sure they weren't at the BCS) and gave me a demo. I need to try it out myself, but my first impression is that it's a very positive step in the right direction. This is not a trip to the supermarket. Perhaps it's more like an afternoon spent at an old fashioned department store when you take your child down to get kitted out for school and are guided through the process by a helpful and knowledgable assistant. In the afternoon we had rotating discussion groups: a chance for everyone to interact and let off a bit of steam. Inevitably we have more questions than answers. Too may standards? Could ANZRS be a useful starting point? What about mapping tools to allow easy translation? Could we have a happy medium: standardise where we can and back this up with a robust set of tools for automating conversion. The reality is that many people are working on the content issues, coming from different angles, using different paradigms, and with different motivations. In the short term it's going to be pretty messy. 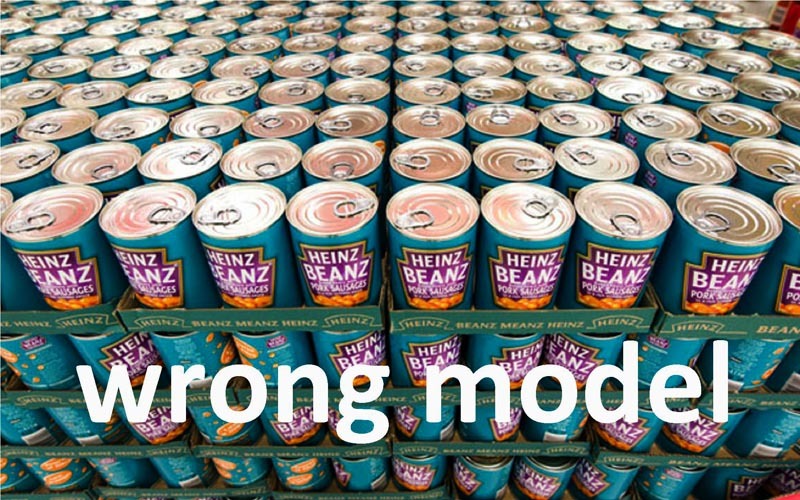 Content modellers and aggregators will continue to pursue the supermarket metaphor. Manufacturers and designers will explore new tools to enhance collaboration. Some eyes will light up with dollar signs. Others will pursue "open-source" solutions. Hopefully we will remain light on our feet, open to new ideas, ready to adapt to a changing ecosystem. One closing thought. Perhaps there is a role here for manufacturers associations. Do we really need a separate app for every supplier of sanitary fittings? Wouldn't it be nice to have a neutral collaboration space where we can compare alternative submissions, assess different proprietary solutions? Wouldn't it be great if these spaces persisted into the construction phase and beyond? 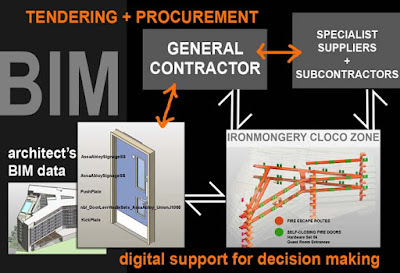 BIM is all about digital support for decision making. But decision making is a social process. Collaboration is the key. Better digital collaboration will lead to better digital content. Let's not but the cart before the horse. Download a version of my short presentation from the link below. I had the great pleasure to meet Stefan Larsson from BIM Object earlier this year at a meeting of our local BIM user group. I want to start by saying that nothing here should be taken as a criticism of the splendid work that they are doing in pushing forward the BIM content agenda and raising the bar on an almost daily basis. 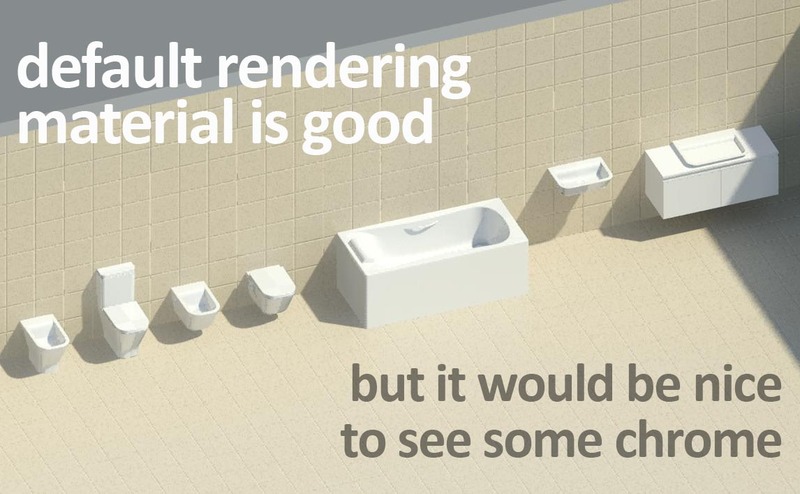 It's feedback: straightforward honest feedback from an experienced Revit user with a long-standing interest in promoting better sanitary ware families that are freely available to all. I have commented on downloads from BIM object before, and there are other links which deal with related issues. I will place these here in case you want to have a look. I'm going to discuss the recently released Roca content. It's a very exciting development, firstly because they are the first really big European brand to make serious BIM content available (I think) and secondly because these really are usable objects. They stand up quite well against families I have made myself. First thing I noticed is that there is widespread use of CAD implants. This is usually a bad thing of course, but there's something intriguing about the way this has been done. 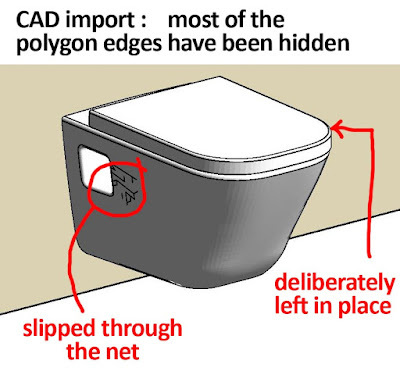 Somehow the edges of the polygons have been hidden. I think this has been deliberately done because some important edges have been left visible, and a few random edges have also slipped through the net. The result is a surprisingly crisp 3d representation. I really don't know how this was done. I suspect it was some tinkering within the CAD file itself. It's interesting to note that one or two unwanted edges have slipped through the net. The effect is a similar in some ways to what you get when you explode an "sat" format solid. But that's not what they did. The CAD imports are still intact. One of the big objections to imported geometry is the accumulation of layers that result within object styles, and sure enough this starts to happen. I think I would have preferred to have just one layer per material, rather than one per object. (called say "Vitreous China - Roca") Actually my own standard is to have a subcategory called "_Porcelain" which I use for all sanitary ware. These days it's all white so you can control the render material easily via that one subcategory. Coarse, Medium and Fine have been diligently applied in a consistent manner. You only see the imports in Fine views. 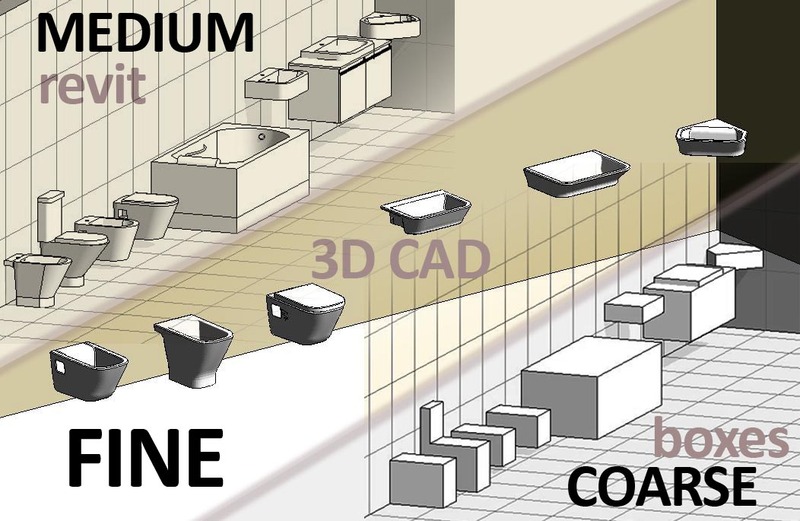 Coarse gives you boxes, as you would expect, and medium displays typical clunky looking revit blends and extrusions that approximate the actual shape and size. Do I want medium ? Does it actually help with performance ? Does the extra geometry have a negative effect, bloating file size for no good reason ? My jury is out on this. I don't understand the performance issues well enough. I can only say that it seems like a lot of effort for very little advantage. More on this shortly. I often find with bulk downloads that there is some inconsistency in the way families have been set up. Perhaps more than one person was involved. I don't know whether these were made by the BIM object team or whether Roca got someone else to do the modelling. I'm not a fan of outsourcing generally and I shudder a little at the prospect of hundreds of manufacturers bashing out there content via the BIM sweat-shops that are springing up in some parts of the world. It's going to be inconsistent and somewhat shoddy. The Roca offering does have some minor inconsistencies. For example the plan views are sometimes masked, sometimes not. Notice tiles showing through in the close-coupled WC. Actually this one is rather carelessly drafted. The cistern is placed off-centre. Also the two bidets are treated differently. One has circles to represent the tap and the waste outlet, but the other does not. Similarly with the two WCs: one has the seat down, the other doesn't seem to have a seat in plan view. These are hardly deal-breakers, but if I was the BIM man at Roca I would be aiming to achieve a slightly crisper and more consistent set with the next release. Another minor inconsistency is in the vertical origin placement and height offsets. 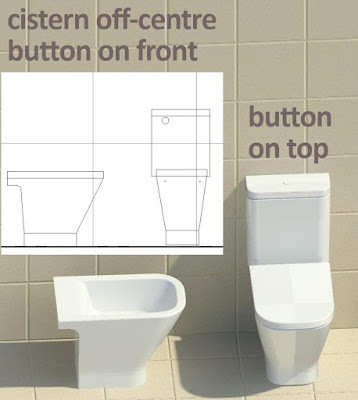 Most families have been made so that they automatically come in at the right height, but the corner basin for some reason has to be given a vertical offset. The zero origin is actually the underside of the basin. This doesn't make any sense at all. The origin should be either FFL or the rim of the basin. In other words, either you should give it an offset of zero to get the standard height, or you should type that standard height into the offset parameter. While we are looking at elevations, I'm going to note that these use symbolic representation. 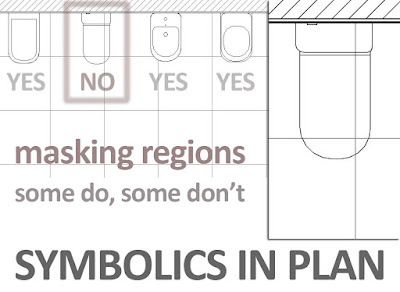 I agree with this approach for sanitary ware, but many do not. It's amusing to see that the close-coupled WC is off-centre in elevation as well. I don't think they make them like this. 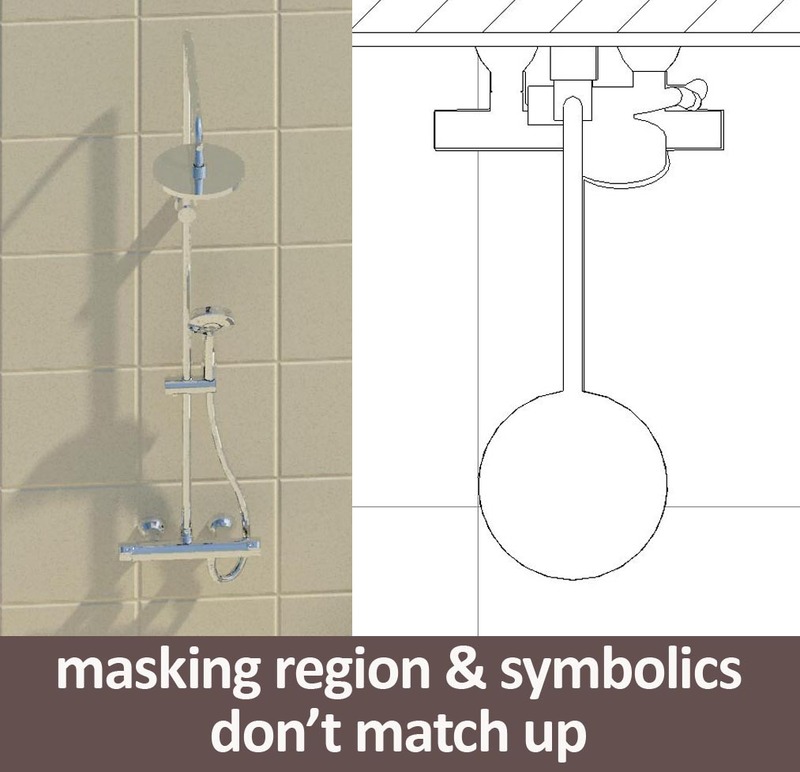 If you are going to do symbolics, I would have included a masking region so that you can do proper internal elevations of your bathrooms. We do those all the time. If you prefer to see the tiles through the fittings (unlikely) you can always make them transparent. You can even over-ride them to show as dashed lines if you like. So include masking regions and let the end user choose. The wall-mounted shower fitting is an interesting case in point. The masking region in plan is shaped as if to hide the 3d geometry, which makes little sense since this is all turned off in plan views. The result is a little messy. Too many lines, all slightly misaligned to each other. One small quibble. Why not include placeholder taps in the families? Having gone to so much trouble to provide accurate forms that render well, a glint of chrome would really help. 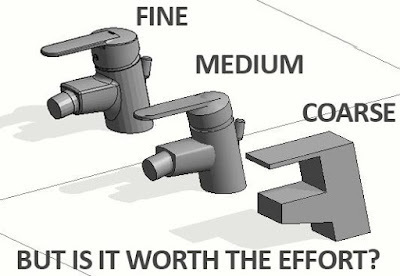 If it doesn't look like the tap I want, I can always swop it out, but most of the time a generic tap shape will do fine. There are some taps, but supplied as separate families. They are provided in the same way as the sanitary ware, with 3 separate versions of the geometry for coarse, medium and fine. Does this make sense for such small objects? 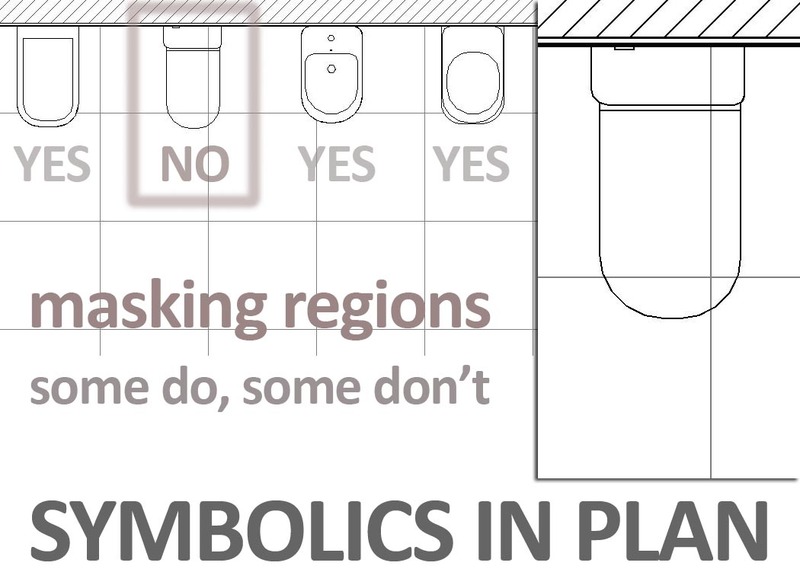 The next little segment is just me thinking aloud with my BIM pencil, exploring some ideas about modelling taps. As supplied, the medium scale version is a little weird. I felt that it could be handled more elegantly, so I replaced the sideways-on extrusion with a blend. Somewhat better methinks. The standard coarse scale "box" approach has always troubled me. Seems just a little TOO crude. So I experimented with something that actually resembles a tap slightly but is still just one simple extrusion. That gives me a sequence from fine to coarse that looks much more sensible and useable to my eyes. But is it really necessary ? I think a strong case could be made for just having the fine version. Most of the time we don't need 3d taps, and for those occasions when we do, why not use the real one ? By the way there is a rather odd displacement of the various elements in this particular tap. The coarse & medium scale versions, masking regions and 3d geometry ... don't match up when viewed in side elevation. 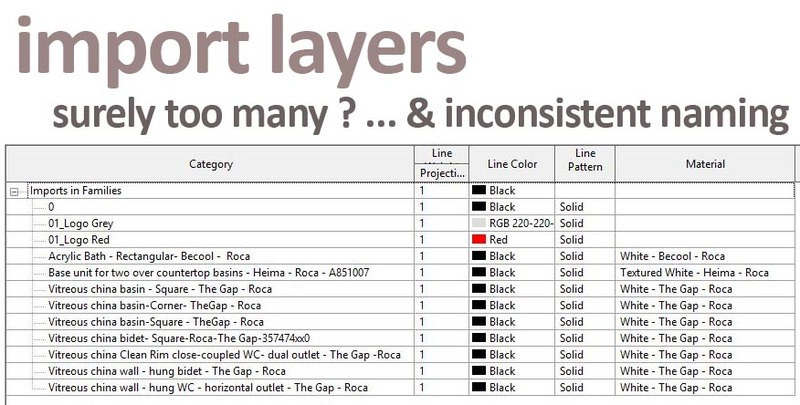 No big deal, just the modelling equivalent of a typo, but it does highlight the underlying problem that we all face in trying to manage all this "stuff" created by different people at different times which ends up in our models and has to be interpreted somewhere down the line by people tasked with procuring components at competitive prices and with assembling them on site. Inevitably I got a bit carried away, imagining what I would like to have "out of the box" from Roca. It turns out that my "medium" version of the bidet tap doesn't look too bad in a rendered view. But what about the toilet seat. Typically I keep these simple and closed. There might be hundreds of them in the project, after all. But what if it was just a one-off villa, or a detailed mock-up of a typical hotel room. Maybe I want to show the seat down and the lid up. Or maybe I even want an angle parameter that opens and closes the lid on an instance basis. That was a fun challenge and turned out to be fairly straightforward. Would be great to have an app that built these families for us at the click of a few buttons. You choose the accessories you want and the level of complexity/detail that is appropriate to the project. 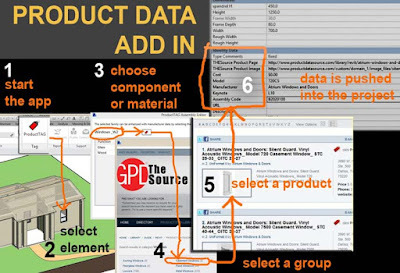 The supplier's software check's that everything is compatible, assembles a family and adds it to your project bundle read for download. Perhaps the bundle is stored in a 3d environment that you can view on-line to check out how the towel rails go with the tiles and the bidet taps. 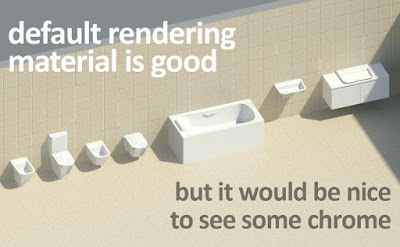 You wouldn't need any Revit skills to do this. You might be a "designer" or a "client representative" who just wants to hand the complete bundle over to the BIM team. One more image to show the quality of orthographic representation I would like to see. I'm not sure who drew the 2d representations for Roca, but they weren't paying very close attention to the actual objects and they don't have the same eye for crisp drafting style that I was taught to admire. Of course it's easy to criticise with hindsight and I have no wish to paint a negative picture. Just take this as someone who "likes to draw" ... exploring the art of the possible. Along the way I took a closer look at polygon edges. Are these Roca objects doing something clever ? Or is it just a happy accident? I wish I knew. But looking closely at various CAD imports I noticed that the edges that don't show up in Revit are also suppressed when opened in AutoCAD. Furthermore, some of the objects that I took to be totally smothered in nasty visible edges were not quite so straightforward on closer inspection. Take the swan chair that I downloaded from Fritz Hansen. The edges that you see are quadrilaterals. But these cannot possibly be planar. Sure enough when you zoom in they are all broken down into two triangles, but all the diagonal edges are hidden. One final thought. 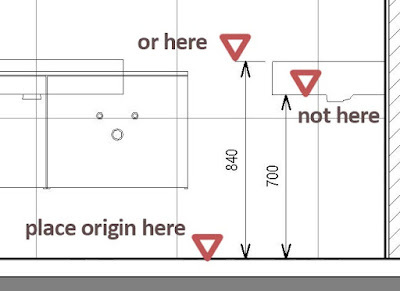 Revit knows how to soften the edges of topography, which is actually just a set of triangulated points. If only we could harness that capability and apply it to CAD imports within families, things like soft furniture and sanitary ware would suddenly become so much easier to do well. I'm going to shift gears now. 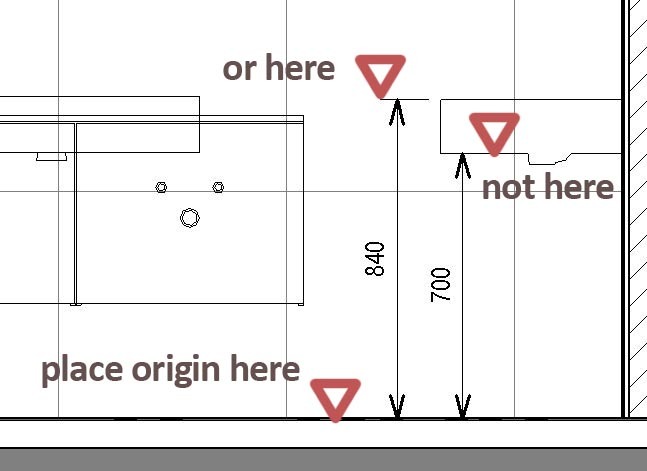 That was a basic review from a Revit user; kind of a QC check to give some pointers on how to improve next time around. Now I want to look a bit further forward and build on the ideas in my "it's the information stupid" presentation. As the supply chain becomes more engaged in the BIM process, I would expect all sorts of new ideas to emerge. These guys are developing new products all the time, updating product codes, tweaking fixing details, offering different accessories etc. They have software that they use to handle various aspects of this process: keeping their inventory up to date, processing orders, whatever. My belief is that step-by-step connections will be made between these internal processes and BIM workflows. Manufacturers will find ways to push product information through more efficiently. Commissioning some guys to make a set of families manually is just step one of the process. Putting them on a web site and letting people download them one by one is also just a first step. It's not really the seamless flow of information we all hope for in "level 3 BIM" or whatever the ultimate workflow comes to be called. I see the GPD plug-in (for example) as a first tentative step in this direction. BIM is all about collaboration, teamwork, an integrated approach. 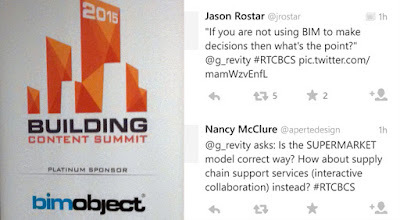 Sticking BIM objects on a web-site is not an integrated, collaborative workflow. Don't we rather need digital enhancements to the kinds of support services that so many manufacturers and specialist suppliers already provide to consultants. Why am I still sending flat drawings to a lift specialist, or an ironmongery supplier. They are dying to input their experience into my design process. Why can't we do that in real time in the cloud ? Is it so hard to filter out those parts of my model that are relevant to them ? Are the Intellectual Property issues so much greater than the ones we already accept by sending them CAD files by email ? I want to have an environment that I can link my project to and press the update button once a week or once a fortnight. I want to engage specialist suppliers as early as possible in the design process and receive regular feedback and guidance from them as the design develops. I want this to be at the level of linked databases that can talk to each other and display feedback in rich, visual formats. "Here are all the fire doors in highlighted in red, the door closers are represented by green dots, notice that we have a problem in these two areas". Or let's say I have this guy who is really experienced at waterproofing landscaped decks. 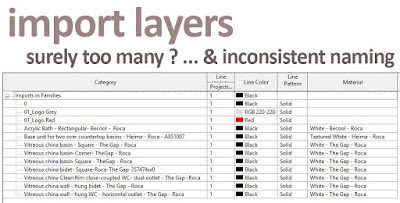 Instead of just downloading a dozen material swatches, plus separate specification clauses and a bunch of 2d CAD details, to stick on my hard drive and have a look at later ... why don't we meet in the cloud. I could link the relevant parts of my model to a space where he can put his specialist software tools to work to develop a proposal: hyperlinks to typical details and specs, preliminary quantities and costings ... all set up so it will be easy to update when my design inevitably changes in response to input from the client, the operator, the engineers, the landscape consultant. It has to become dynamic and interactive. That's starting to happen with the inner core of the design team, but out on the periphery we are still thinking in terms of "send me your catalogue". All we are doing is breaking that catalogue up into a thousand separate BIM object downloads. Which brings me to another point. 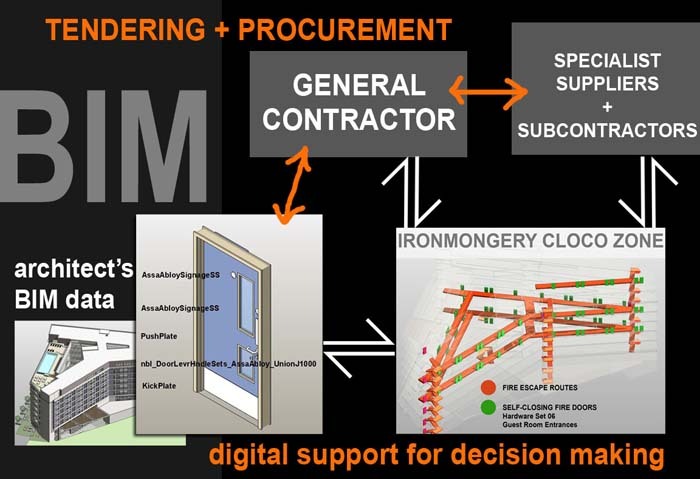 There are a few suppliers who aggregate their BIM objects into collections. Very occasionally these collections include sheets which arrange the products into logical groups and use tags to display some of their properties. There may even be one or two who use schedules to summarise this data in an organised way. It's not rocket science. It's the way we are presenting information about building projects. Why aren't we presenting product ranges in the same, integrated, intelligent manner? So to conclude, let me repeat. I'm not trashing anyone here. I'm not even saying "I could do better", because I don't think I could. All I'm saying is "I've got some ideas, we're all in this together, maybe you will find them useful, this is just the beginning, we could take it so much further, don't you think ?" So to Stefan Larsson, Stephen Hamil, Daniel Hughes and thousands of other guys out there: you're doing a great job, forgive my impetuosity, and keep up the good work.